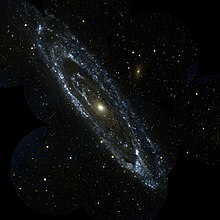 仙女座星系（Andromeda Galaxy，國際音標為：/ˌanˈdrɒmədə/，也稱為梅西爾31、星表编号为M31和NGC 224，在舊文獻中曾經稱為仙女座星雲）是一個螺旋星系，距離地球大約250萬光年，是除麦哲伦云（地球所在的银河系的伴星系）以外最近的星系。位於仙女座的方向上，是人類肉眼可見（3.4等星）最遠的深空天體。 仙女座星系被相信是本星系群中最大的星系，直径约20万光年，外表颇似银河系。本星系群的成員有仙女星系、銀河系、三角座星系，還有大約50個小星系。但根據改進的測量技術和最近研究的數據結果，科學家現在相信銀河系有許多的暗物質，並且可能是在這個集團中質量最大的。 然而，史匹哲太空望遠鏡最近的觀測顯示仙女座星系有將近一兆（1012）顆恆星，數量遠比我們的銀河系多。在2006年重新估計銀河系的質量大約是仙女座星系的50％，大約是7.1×1011M☉. ^ 1.0 1.1 1.2 1.3 1.4 1.5 1.6 NASA/IPAC Extragalactic Database. Results for Messier 31. [2006-11-01]. ^ 2.0 2.1 2.2 Karachentsev, I. D.; Kashibadze, O. G. Masses of the local group and of the M81 group estimated from distortions in the local velocity field. Astrophysics. 2006, 49 (1): 3–18. ^ 3.0 3.1 3.2 I. Ribas, C. Jordi, F. Vilardell, E.L. Fitzpatrick, R.W. Hilditch, F. Edward. First Determination of the Distance and Fundamental Properties of an Eclipsing Binary in the Andromeda Galaxy. Astrophysical Journal. 2005, 635: L37–L40. ^ Dark matter comes out of the cold. BBC News. February 5, 2006 [2006-05-24]. ^ Young, Kelly. Andromeda galaxy hosts a trillion stars. NewScientistSpace. 2006-06-06 [2006-06-08] （英语）. ^ W. Herschel. On the Construction of the Heavens. Philosophical Transactions of the Royal Society of London. 1785, 75: 213–266. ^ William Huggins. On the Spectra of Some of the Nebulae. Philosophical Transactions of the Royal Society of London. 1864, 154: 437–444. ^ Roberts, Isaac. A Selection of Photographs of Stars, Star-clusters and Nebulae, Vol. II. London: The Universal Press. 1899. ^ V.M. Slipher. The Radial Velocity of the Andromeda Nebula. Lowell Observatory Bulletin. 1913, 1: 2.56–2.57. ^ Heber D. Curtis. Novae in Spiral Nebulae and the Island Universe Theory. Publications of the Astronomical Society of the Pacific. January 1988, 100: 6. ^ E. P. Hubble. A spiral nebula as a stellar system, Messier 31. Astrophysical JournalEngl. 1929, 69: 103–158. ^ W. Baade. The Resolution of Messier 32, NGC 205, and the Central Region of the Andromeda Nebula. Astrophysical Journal. 1944, 100: 137. ^ Malik, Tariq. Crash Course: Simulating the Fate of Our Milky Way. SPACE.com. 2002-05-07 [2006-09-18] （英语）. ^ Dr. John Dubinski, University of Toronto. A Collision Between The Milky Way And The Andromeda Galaxy. [2006-05-24]. （原始内容存档于2006-05-17）. ^ Holland, Stephen. The Distance to the M31 Globular Cluster System. The Astronomical Journal. 1998, 115 (5): 1916–1920. doi:10.1086/300348. ^ Stanek, K.Z., Garnavich, P.M. Distance to M31 With the HST and Hipparcos Red Clump Stars. Astrophysical Journal Letters. 1998, 503: 131–141. ^ N. W. Evans & M. I. Wilkinson. The mass of the Andromeda galaxy. Monthly Notices of the Royal Astronomical Society. 2000,. 316 issue 4: 929–942. ^ Moore, Sir Patrick. Oxford Astronomy Encyclopedia. New York: Oxford University Press. 2002. ISBN 978-0-19-521833-6. ^ W. Liller, B. Mayer. The Rate of Nova Production in the Galaxy. Publications Astronomical Society of the Pacific. July 1987, 99: 606–609. ^ R.L. Beaton, E. Athanassoula, S.R. Majewski, P. Guhathakurta, M.F. Skrutskie, R.J. Patterson, M. Bureau. Unveiling the Boxy Bulge and Bar of the Andromeda Spiral Galaxy. Astrophysical Journal Letters. 2006. ^ S. C. Chapman, R. Ibata, G. F. Lewis, A. M. N. Ferguson, M. Irwin, A. McConnachie, N. Tanvir. A kinematically selected, metal-poor spheroid in the outskirts of M31. Astrophysical Journal. 2006. Also see the press release, Andromeda's Stellar Halo Shows Galaxy's Origin to Be Similar to That of Milky Way (新闻稿). CalTech Media Relations. February 27, 2006 [2006-05-24]. ^ Astronomers Find Evidence of an Extreme Warp in the Stellar Disk of the Andromeda Galaxy (新闻稿). UC Santa Cruz. January 9, 2001 [2006-05-24]. （原始内容存档于2006年5月19日）. ^ V. C. Rubin, W. K. J. Ford. Rotation of the Andromeda Nebula from a Spectroscopic Survey of Emission. Astrophysical Journal. 1970, 159: 379. ^ H. Arp. Andromeda Nebula from a Spectroscopic Survey of Emission. Astrophysical Journal. 1964, 139: 1045. ^ ISO unveils the hidden rings of Andromeda (新闻稿). Esa Science News. October 14, 1998 [2006-05-24]. （原始内容存档于1999年8月28日）. ^ Busted! Astronomers Nab Culprit in Galactic Hit-and-Run. Harvard-Smithsonian Center for Astrophysics. October 18, 2006 [2006-10-18]. （原始内容存档于2006年10月29日）. ^ J. S. Kalirai, K. M. Gilbert, P. Guhathakurta, S. R. Majewski, J. C. Ostheimer, R. M. Rich, M. C. Cooper, D. B. Reitzel, R. J. Patterson. The Metal-Poor Halo of the Andromeda Spiral Galaxy (M31). Astrophysical Journal. 2006. ^ J.S. Bullock and K.V. Johnston. Tracing Galaxy Formation with Stellar Halos I: Methods. Astrophysical Journal. 2005,. 635, issue 2: 931–949. ^ Hubble Space Telescope Finds a Double Nucleus in the Andromeda Galaxy (新闻稿). Hubble news desk STScI-1993-18. July 20, 1993 [2006-05-26]. ^ R., Barnard; U. Kolb; J.P. Osborne. Timing the bright X-ray population of the core of M31 with XMM-Newton. A&A. August 2005. ^ P. Barmby, J.P. Huchra. M31 Globular Clusters in the Hubble Space Telescope Archive. I. Cluster Detection and Completeness. Astrophysical Journal. 2001, 122: 2458–2468. ^ Hubble Spies Globular Cluster in Neighboring Galaxy (新闻稿). Hubble news desk STSci-1996-11. April 24, 1996 [2006-05-26]. ^ G. Meylan, A. Sarajedini, P. Jablonka, S.G. Djorgovski, T. Bridges, R.M. Rich. G1 in M31 - Giant Globular Cluster or Core of a Dwarf Elliptical Galaxy?. Astrophysical Journal. 2001, 122: 830–841. ^ A.P. Huxor, N.R. Tanvir, M.J. Irwin, R. Ibata. A new population of extended, luminous, star clusters in the halo of M31 (PDF). Monthly Notices of the Royal Astronomical Society. 2005, 360: 993–1006. ^ K. Bekki, W.J. Couch, M.J. Drinkwater, M.D. Gregg. A New Formation Model for M32: A Threshed Early-type Spiral?. Astrophysical Journal. 2001,. 557, issue 1: L39–L42. ^ R. Ibata, M. Irwin, G. Lewis, A.M. Ferguson, N. Tanvir. A giant stream of metal-rich stars in the halo of the galaxy M31. Nature. July 5, 2001,. 412(6842): 49–52. ^ A. Koch and E.K. Grebel. The Anisotropic Distribution of M 31 Satellite Galaxies: A Polar Great Plane of Early-Type Companions. Astronomical Journal: 1405–1415. Andromeda galaxy on SolStation site.